The wine is mainly fermented in temperature-controlled stainless-steel vats, with a little in French oak barrels. The white grapes spend a few hours on their skins in the pneumatic presses, to extract their full aromatic potential. Then, the must is cold-settled prior to alcoholic fermentation. The Entre-Deux-Mers is fermented in vats on fine lees. The Cuvée Majeure is barrel-fermented and continues ageing in barrel for approximately seven months. For the Crémant, the grape harvest is manual in crates. After alcoholic fermentation in the vat, the still wine is bottled at the beginning of the following year. The traditional method is made in cellars at 12 ° C protected from light. The maturing lasts between 9 and 12 months. Vatting time may vary from 15 to 25 days at approximately 28° C to preserve all the finesse, fruit, and tannin from the grapes. 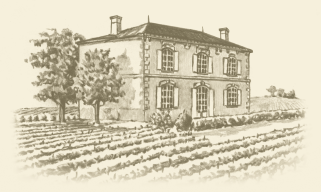 After alcoholic and malolactic fermentation, the Château Turcaud is aged for 12 to 18 months, partly in vat and partly in barrel, while the Cuvée Majeure spends more time in new barrels. The rosé is kept on the skins for a very short time, only two to five hours, to extract a pale colour while preserving all the wine's fresh liveliness. The clairet has a longer period of cold skin contact, approximately four days, which gives it a deeper colour and more body on the palate.